I recently saw your post about the JVC Balladeer and I was surprised to see that I have a Guyatone in this (I think) same body/headstock design. The major difference is the pickguard configuration and it is certainly of a lower level model with no tremolo system. The pickguard is still of metal construction, just a flat finish and the controls on top of the pickups, which is actually quite comfortable. 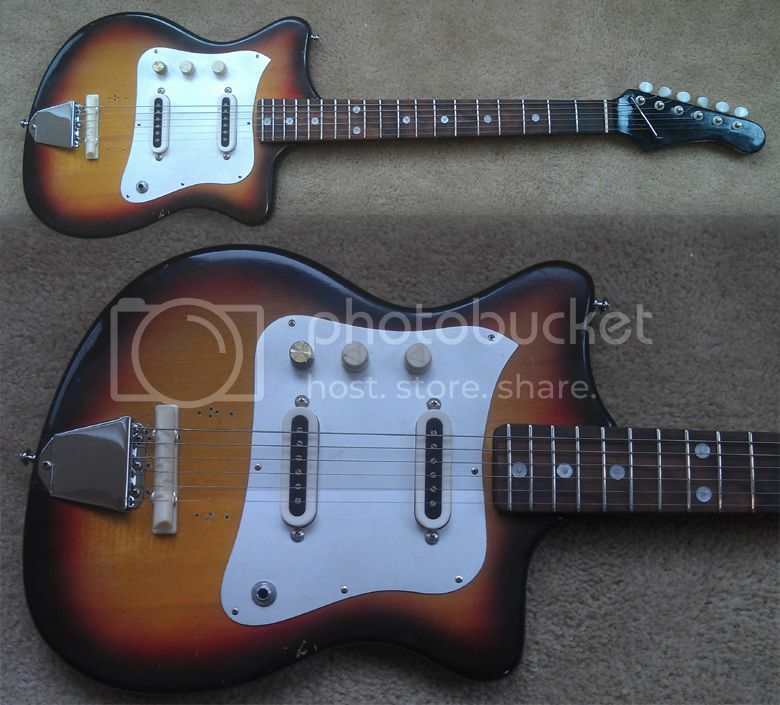 I have looked and looked all over the web and I've yet to see any Kawai/Teisco/Guyatone Japanese guitars with this same exact body design. 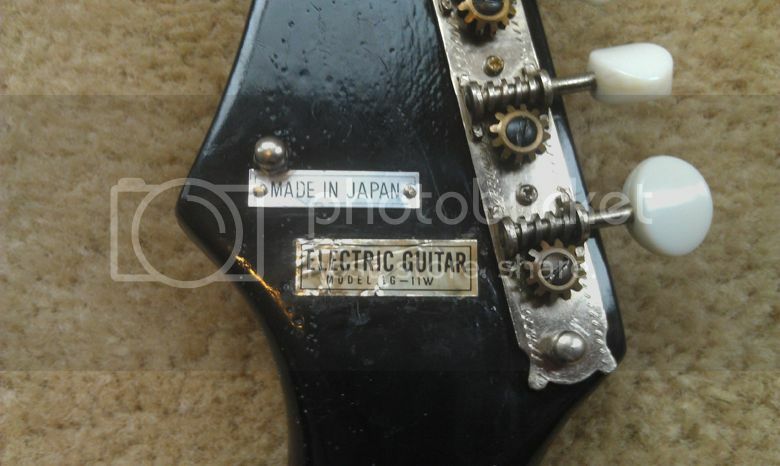 It has model number of LG-11W, which falls in line with Guyatone model numbers and of course has a 'Made in Japan' sticker, but unfortunately it no longer has its headstock badge (just a sticky residue of where one used to live). In fact, I'm in the middle of refurbishing the neck and fingerboard due to too much lovin'! This thing was played to death and I'm certain whoever attempted to refret the fingerboard was not a pro, as there where large chips in the dried out rosewood. I decided to refinish the black neck paint while I was at it, which showed large stress cracks through the finish. I'm by no means a "pro" luthier, but I am an inspiring luthier who has made his own guitars. And as some may think this is sacrilege, I've decided to turn this 24.5" scale into a 25.5" scale and move the bridge/tail back that extra inch. I liked the feel of 24.5" but it was way too narrow for my liking. If I had any intention of selling the guitar, I would have of course kept it to its original scale. Here's a YouTube video of Joshua demoing the guitar. It just goes to show there's life in some of those old Japanese "pawn shop" guitars, although some of them might need some resuscitation. We're always happy to see readers' guitars - the more interesting or unusual the model, the better - so please do keep sending in your photos and stories. Contrary to widely held belief, we at Guitarz can appreciate a nice Strat, Tele, Les Paul or SG the same as the next man, woman or dog; however, I think all our readers already know what they look like and what they can do, so we would prefer to see something just a little bit different from the run-of-the-mill guitars you see everywhere. Having said that, if you do have a Strat, Tele, Les Paul, SG, etc, with a particular story to tell, or an unusual variant or finish, then we wouldn't rule out including it on the blog.